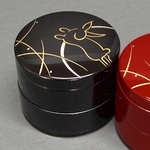 Lacquerware is an ancient technique used to seal and finish wood. It uses natural sap from the lacquer tree to give wood a beautiful, glossy finish. Now imagine this rich natural finish combined with Japanese craftsmanship! Japan has been known for its lacquerware for centuries. It's known as Urushi there, since that's the Japanese name for the lacquer tree. The red or black lacquer is then further embellished with a traditional Japanese gilding technique, called maki-e.